At this time of year there are a lot of winter themed sims in Second Life, many with their own falling snow effects. However, there are still plenty with just snow covered ground. If you're a keen Second Life photographer and want to add your own falling snow to the scenes you capture, then follow this quick and simple Gimp tutorial to find out how. 1/ Start up Gimp and open the image you want to use. The image used here is 1024 X 790px and this influenced some of the numbers used in some of the settings, so bear this in mind and be prepared to be flexible when applying this effect. 2/ Create a transparent layer on top of the image layer and make sure its the active layer. Select the Rectangle Select Tool highlighted in the image above. Hold down the left mouse button and drag out a square in the transparent layer. 3/ Towards the bottom of the Toolbox there is an option to size the square you just created, highlighted in the image above. Resize the square to 256 X 256px. 4/ Now using the Bucket fill Tool fill the square with black. 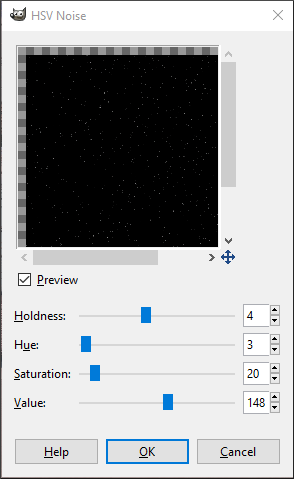 5/ Now select Filters > Noise > HSV Noise, and a window similar to the above will appear. Use the sliders to get the settings something like the above, then hit OK.
6/ From the Select menu click None, then in the Layers menu click Autocrop Layer. 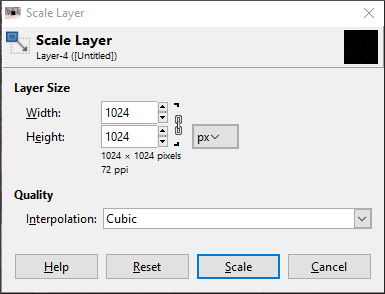 Again under the Layers menu select Scale Layer and a window similar to the above should open. 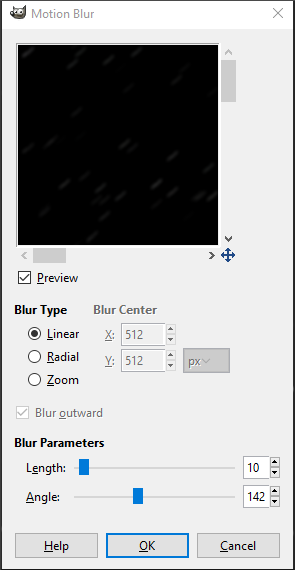 Scale the black square up to the size of the image layer. Here I just used 1024px for both the width and height which works fine. After entering the scale of the layer hit Scale. 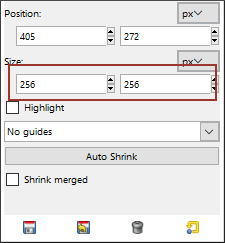 You will probably now need to use the Move Tool from the Toolbox to align the scaled layer with the image layer. 7/ Now we want to give the snow a sense of falling, so select Filters > Blur > Motion Blur and choose settings similar to the above, although you may need to change them to suit your own image. When you're done hit OK.
8/ From the top of the Layers Panel select Addition from the Mode drop down menu, which will clear the black from the snow layer, and your snow effect should look something like the above. 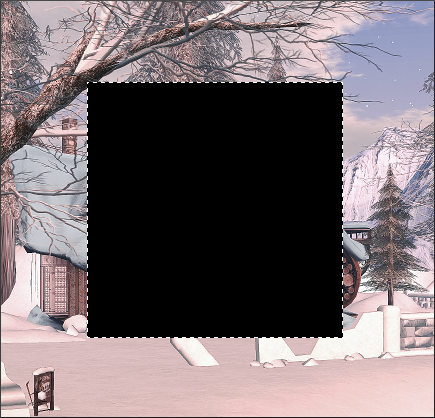 9/ We now want to give the falling snow some depth, so create another transparent layer and use the Rectangle Select Tool again to create another square. This time size it to 128 X 128px. Now repeat steps 3 and 4 using the new layer. 10/ Select Filters > Noise > HSV Noise again, and add settings similar to those in the above image, although adapt them to suit your own image. 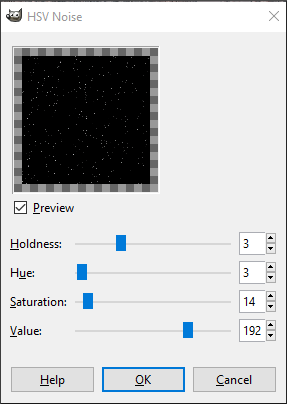 11/ Hit Select > None, then Layers > Autocrop Layer and then scale the new snow layer to the size of the image layer. Now add some motion blur to the layer, tweaking the settings so they're not exactly the same as the original ones used earlier. 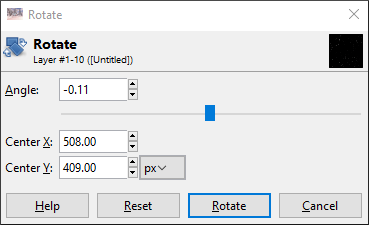 12/ Align the new layer with the image layer, then select Addition again from the Mode drop down menu at the top of the Layers Panel. 12/ So that all of the snow isn't falling in exactly the same way you can rotate the second snow layer a little. 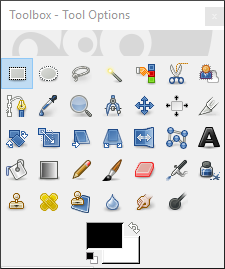 From the Toolbox panel, select the Rotate Tool and a window similar to the above will open. This shows the settings used for the image here, but you may want to tweak them to suit your own image. When you're ready hit Rotate and you're done. You've now completed this quick and easy way of adding a snow effect to your Second Life image, and no doubt you have quickly realised its easy to adapt the settings to get the effect you want for a particular image. Have fun with this and enjoy creating your wintery scenes.